Description This chapter presents the decision algorithmIn mathematics and computer science, an algorithm (Listeni/ˈælɡərɪðəm/ AL-gə-ri-dhəm) is a self-contained sequence of actions to be performed. Algorithms can perform calculation, data processing and automated reasoning tasks. Prediction without Pigment, a stepwise method for the assessment of skin lesions which are not pigmented by melanin. This method assesses for malignancy regardless of melanocyticThis glossary term has not yet been described. status as in equivocal cases only the dermatopathologist can make that distinction. 1.1.2.1 Step 1: Is there ulceration? 1.1.2.2 Step 2: Are there “white” clues? 1.1.2.3 Step 3: Is the vessel pattern consistent with malignancy? Prediction without Pigment – cite! Prediction without Pigment (message) Prediction without Pigment – participate! For the purpose of this algorithm non-pigmented lesions are lesions without evidence of melanin pigmentation. There must be no brown or grey colour. Black, purple or blue colour, when present must be apparently due to blood rather than melanin, this usually being the case if they are associated with red colour only. The dermatoscopic evaluation is more challenging when pigmented structuresThis glossary term has not yet been described. are absent but an understanding that there are certain useful cluesEvidence, in an investigation that can be prioritised above vessel clues has facilitated the development of an algorithmic method analogous to Chaos and CluesThis glossary term has not yet been described. as applied to pigmented lesions. Revised pattern analysisThis glossary term has not yet been described. is designed to lead to a provisional diagnosisis the identification of the nature and cause of a certain phenomenon. Diagnosis is used in many different disciplines with variations in the use of logic, analytics, and experience to determine "cause and effect". In systems engineering and computer science, it is typically used to determine the causes of symptoms, mitigations, and solutions in a logical stepwise process. Like the method Chaos and Clues for pigmented lesions, Prediction without Pigment is an algorithmic method which uses pattern analysis to guide the clinician in a stepwise process to the decision about whether (excision) biopsy is indicated. The same 5 groups of common benignis any condition that is harmless in the long run lesions defined in the chapter on Chaos and Clues apply whether pigmented or non-pigmented lesions are being considered – with the addition of benign cysts when considering non-pigmented lesions. These groups include non-pigmented varieties of naevus; benign keratinocytic (including viral wartsThis glossary term has not yet been described. and actinic keratoses) lesions; hemangiomaThis glossary term has not yet been described.This glossary term has not yet been described. ; dermatofibromaDermatofibromas are hard solitary slow-growing papules (rounded bumps) that may appear in a variety of colours, usually brownish to tan; they are often elevated or pedunculated. A dermatofibroma is associated with the dimple sign; by applying lateral pressure, there is a central depression of the dermatofibroma. and sebaceous gland hyperplasia as well as the additional category of benign cyst. These benign lesions should be identified by the process of pattern-recognition due to their characteristic morphologyThis glossary term has not yet been described.. As is the case for pigmented variants of these lesions, they are ubiquitous and the clinician can very rapidly become an expert at recognising them by deliberately looking at thousands of them to understand their characteristic protean variations. Malignant lesions such as basal cell carcinomais the most common skin cancer, and one of the most common cancers in the United States. While BCC has a very low metastatic risk, this tumor can cause significant disfigurement by invading surrounding tissues (BCCAbbreviation for Basal Cell Carcinoma) may also be identified by pattern recognition and this is expected to happen more frequently with increasing experience. However expertise in pattern recognition can be achieved much earlier with benign lesions because the dermatoscopist will have the opportunity to examine many of them in a short time. Just as pigmented lesions are selected in routine practice for dermatoscopic analysis by recognising “Red Flags” the same principleThis glossary term has not yet been described. is applicable to non-pigmented lesions. 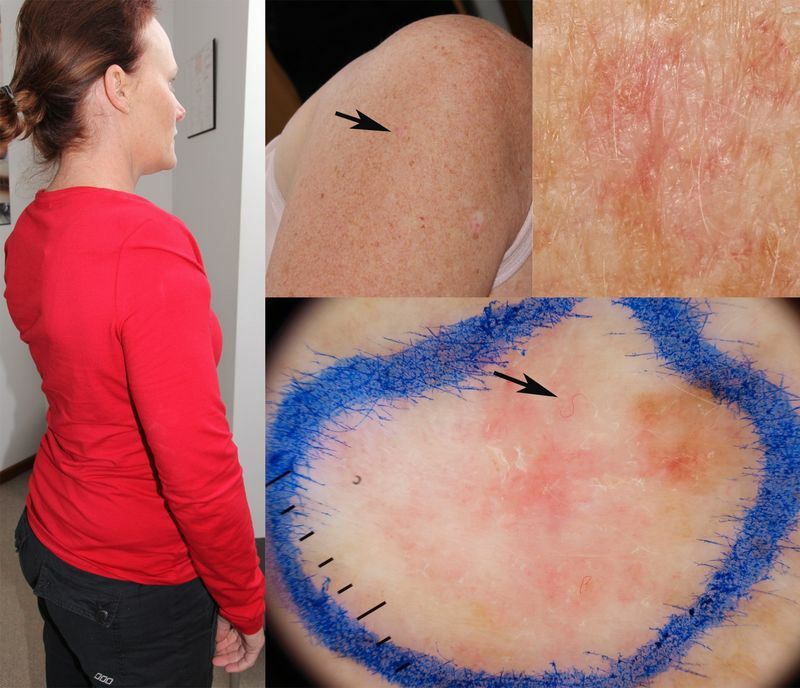 In cases where clinical or dermatoscopic pattern-recognition as not possible, or where additional concerns are present (see “Red Flags” below) we recommend initial evaluation by the decision algorithm: Prediction without Pigment. Red Flags represent additional features that flag a lesion as suspicious and therefore warranting formal algorithmic assessment. These features are such that they will either be known (patient concern), be clinically obvious (clinical pattern-breaker, ulceration, surface keratin on a raised lesion) or be recognisable during scanning dermatoscopic evaluation (e.g. polarising-specific white linesstreaksThis glossary term has not yet been described.). Just as for pigmented lesions, no lesion of patient concern should ever be dismissed without targeted examination including dermatoscopyThe examination of [skin lesions] with a 'dermatoscope'. This traditionally consists of a magnifier (typically x10), a non-polarised light source, a transparent plate and a liquid medium between the instrument and the skin, and allows inspection of skin lesions unobstructed by skin surface reflections. Modern dermatoscopes dispense with the use of liquid medium and instead use polarised light to cancel out skin surface reflections.. Patient concern should automatically flag a lesion as suspicious and lead to an analytical assessment. Similarly documented evidence of change at mature ageprocess of becoming older flags a lesion as suspicious, therefore requiring focused dermatoscopic assessment. In particular any elevated, firm and continuously growing (EFG) lesion should be subjected to excision biopsy. The same disorganised and uncontrolled behaviour of malignant tissue that causes dermatoscopic chaos often causes non-pigmented as well as pigmented malignant lesions to break the pattern of the surrounding skin clinically. Malignant lesions may arise randomly, have an irregular unexpected shape, or their unrestrained growth may make them larger than surrounding benign lesions. Any lesion which breaks the pattern clinically should be flagged as suspicious and be dermatoscopically analysed. StructuresThis glossary term has not yet been described. pigmented by melanin provide valuable patternsThis glossary term has not yet been described. and clues for assessment and when such structures are present, even focally, the lesion is generally best assessed as a pigmented lesion. As mentioned above when such structures are absent the assessment is more challenging and because of this it is useful to use all available information, both clinical and dermatoscopic, when assessing such lesions. It is known that ulceration is commonly present in BCC and for this reason the presence of ulceration, often best assessed clinically, is given first priority in the decision algorithm Prediction without Pigment. It is also known that the presence of white lines seen with either polarised or non-polarised dermatoscopy, a clue to malignancy in the assessment of pigmented lesions, is also a useful clue in the non-pigmented variants of those same lesions and for this reason it has been given priority after the assessment of ulceration. A study has shown that with respect to the assessment of raised non-pigmented lesions, the keratin clues of surface keratin, white structureless areas and white circlesThis glossary term has not yet been described., are more robust than vessel clues  and therefore these clues are given priority over vessel clues. 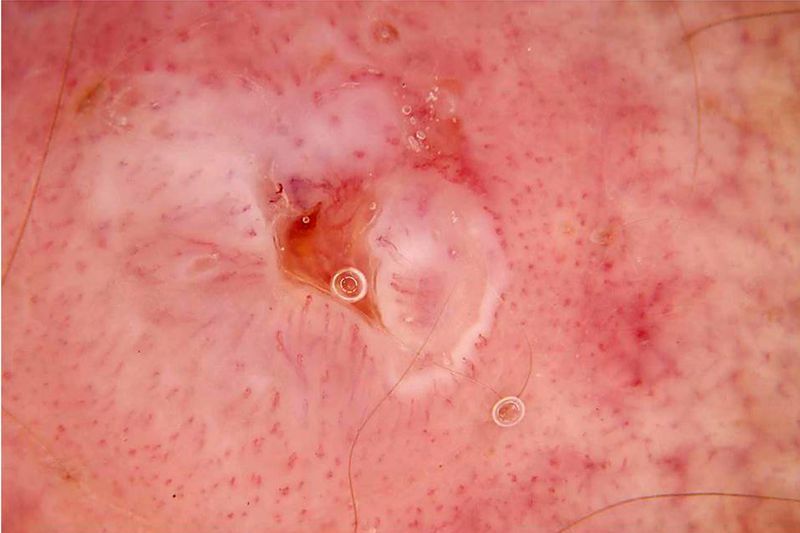 Because one of the purposes of dermatoscopy is to render keratin invisible, surface keratin is often best displayed clinically but in raised lesions it is generally also seen dermatoscopically. The clues of white structureless areas and white circles are dermatoscopic clues. The Prediction without Pigment algorithm, displayed in figure 1, is a decision algorithm, although revised pattern analysis can be applied to carry the process further to attempt to predict the specific diagnosis. Step 1: Is there ulceration? Because BCC is the most common non-pigmented skin malignancy and because ulceration is frequently present on the surface of BCC, this is the first assessment in the Prediction without Pigment algorithm. Considering that the dermatoscopeThis traditionally consists of a magnifier (typically x10), a non-polarised light source, a transparent plate and a liquid medium between the instrument and the skin, and allows inspection of skin lesions unobstructed by skin surface reflections. Modern dermatoscopes dispense with the use of liquid medium and instead use polarised light to cancel out skin surface reflections. is generally applied to non-pigmented lesions of concern, ulceration caused by significant traumaThis glossary term has not yet been described. should not be a confounding factor. Furthermore if ulceration of a lesion of concern is observed with the naked eye that only increases the appropriateness of dermatoscopic examination because if the lesion is malignant additional dermatoscopic clues can be expected to add weight to the suspicion of malignancy as well as providing evidence for the precise diagnosis. Of course dermatoscopy may actually make ulceration more difficultneeding much effort or skill to accomplish to appreciate because the application of immersionThis glossary term has not yet been described. 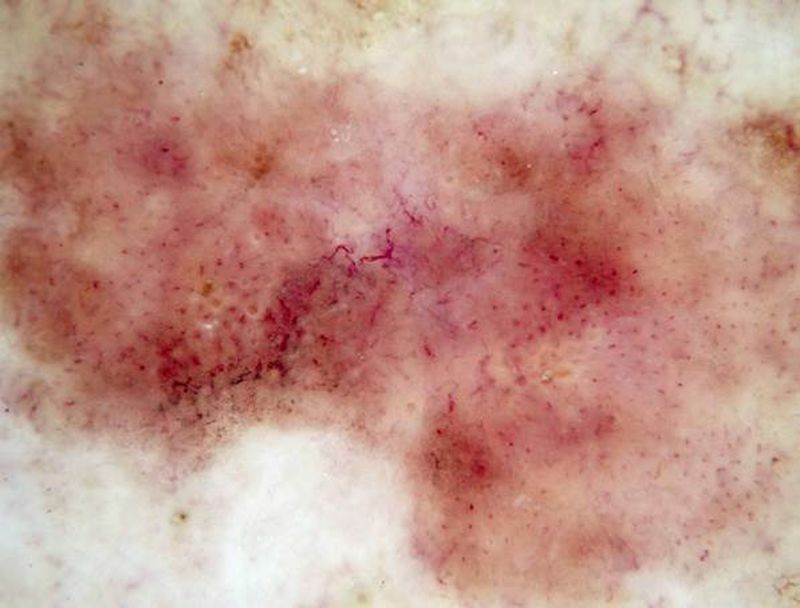 fluid or even the use of polarised light with non-contact dermatoscopy may render the optical features of ulceration invisible. There is however a dermatoscopic clue to ulceration which may be observed even in cases of micro-ulceration which is not apparent clinically and that is the presence of adherent fibre (see figure 2). 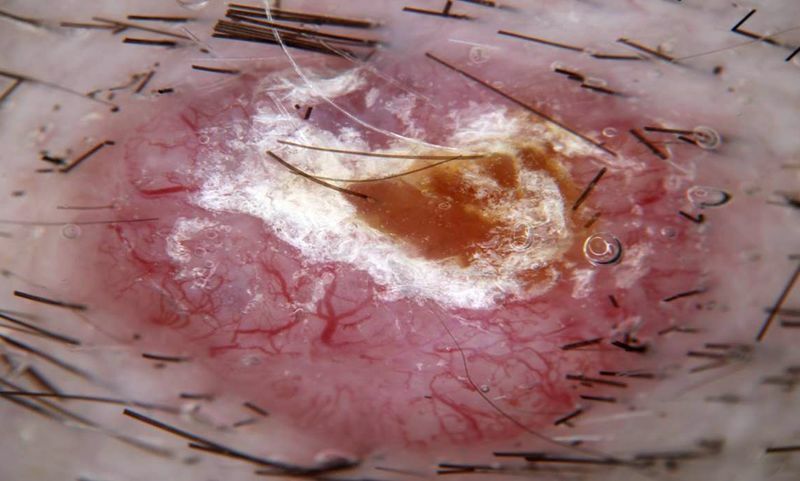 Ulceration results in a serum exudate which may trap clothing fibre or other environmental or intrinsic matter, including hairThis glossary term has not yet been described., and the observation of such material may be a clue to occult ulceration which may not have been otherwise apparent. It should also be remembered that ulceration can have secondary effects including the promotion of angioneogenesis. Unexpected vessel morphology including a polymorphous vessel pattern may result (see figure 3), as well as in some cases keratinisation (see figure 4), leading to features such as surface keratin or white circles, normally expected in squamous cell carcinomaThis glossary term has not yet been described. (SCCSquamous cell carcinoma) but not BCC. Step 2: Are there “white” clues? in any raised non-pigmented lesion the keratin clues of surface keratin (clinical or dermatoscopic), white structureless areas (dermatoscopic) or white circles (dermatoscopic). As for pigmented lesions the clue of white lines may be seen with non-polarising and/or polarising dermatoscopy and to be classified as white lines they must be at least as white as the peri-lesional skinThis glossary term has not yet been described..
Polarising-specific white lines; straight, orientated perpendicularly to each otherThis glossary term has not yet been described., not crossing and frequently shifting as the dermatoscope is rotated, are the white lines most frequently seen in non-pigmented lesions, being a valuable clue particularly to BCC (see figure 5). They can also be seen (uncommonly) in SCC in situnot seen to be spreading from a localized position and lichen planus like keratosisThis glossary term has not yet been described. (LPLKLichen planus like keratosis) and correlation with vessel morphology may be necessary when attempting to predict a specific diagnosis. Differentiation from the other benign lesions where this clue may be seen, dermatofibroma (DF), and Spitz naevus, is less often a concern when pigment is absent and of course, apart from DF the distinction is not critical because Spitz naevi should be excised regardless of the age of the patient due to the fact that differentiation from Spitzoid melanomaThis glossary term has not yet been described. cannot be made with confidence without histological confirmation – and even that may be equivocal. Similarly polarising-specific white lines may be seen in amelanotic melanomatype of skin cancer in which the cells do not make melanin, where vessel clues can often (but not always – see figure 6) be used to distinguish BCC from melanoma, a polymorphous pattern including patterns of dotSee [[Glossary:Dots|Dots]] vesselsThis glossary term has not yet been described. being a frequent feature of melanoma but not of BCC. Polarising-specific white lines may also be seen in scar tissue, such as after cryotherapy or curettage and cautery, so as with any clue the contextThis glossary term has not yet been described. is relevant. TraumaThis glossary term has not yet been described. to benign lesions, with consequential scaring can also lead to polarising-specific white lines but this should generally be left for the dermatopathologist to confirm. 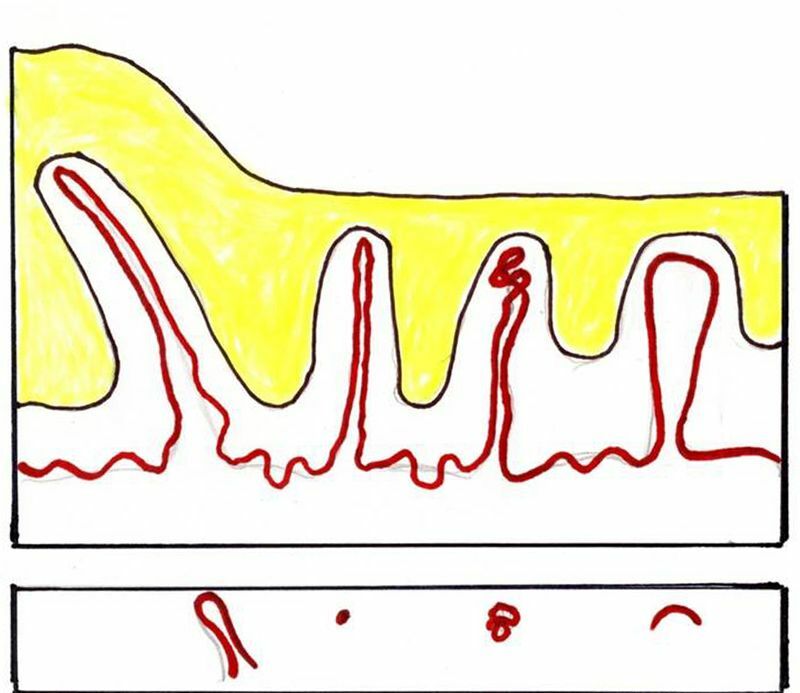 Figure 5: Polarising-specific white lines; straight, whiter than surrounding skin and perpendicularly orientated are a striking dermatoscopic feature only seen with polarised dermatoscopy (left). A monomorphous pattern of branched serpentine vessels as well as the characteristic translucent stroma which casts the vessels into sharp focus, are supporting evidence that this is a BCC. Figure 6: Two lesions on the same 30 year-old woman. On the left thigh (left imagesA representation of a person, animal or thing, photographed, painted or otherwise made visible.) is a lesion with the pattern-recognition features of a haemangioma (clods-only pattern with a few linear variants as commonly seen with very small haemangiomas). The lesion on the right thigh does not have the pattern-recognition morphology of any of the 6 common benign groups so is analysed carefully. Polarising-specific white lines are clearly visible and take priority over vessels (there are none of the 4 benign vessel patterns anyway) leading to excision biopsy. Amelanotic melanomatype of skin cancer in which the cells do not make melanin Breslow thickness 0.8mm. The keratin clues of surface keratin, white structureless areas and white circles are only applicable to raised non-pigmented lesions. A raised lesion is defined as a lesion which is visibly or palpably raised, other than due to surface keratin, or a lesion which has the dermatoscopic clue to a raised lesion of looped vesselsmetaphoric term: hairpin vessels <br /> two parallel linear vessels forming a half looped or hairpin like structure <br /> seen in seborrheic keratosis viral warts (see figuresThis glossary term has not yet been described. 7 and 8). 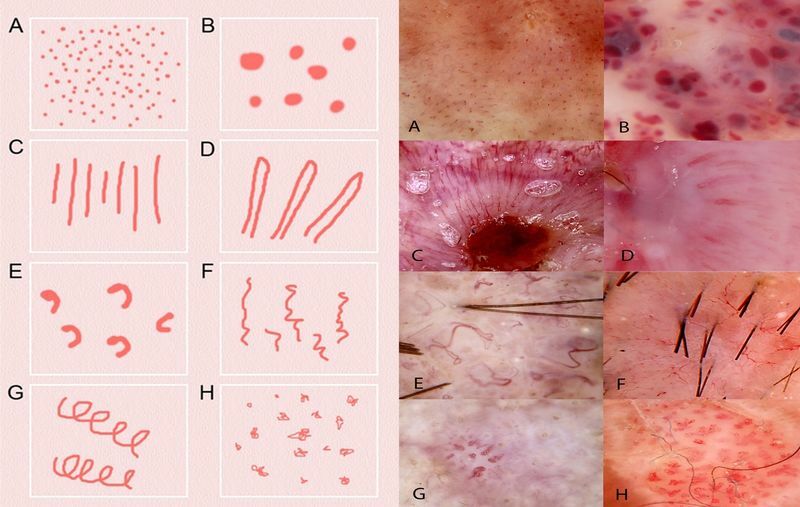 Figure 7: A diagrammatic representation of dermal papillary vessels and the variety of dermatoscopic projections which is possible (lower panel). On the right side of the diagram a vessel which enters the dermal papilla from below ascends to the top and curves across before descending will appear a curved vessel. If it is convoluted it will appear as a coiled vessel and if it turns on itself sharply it will appear as a dot. Once a lesion becomes raised the dermal papilla distorts laterally so whatever the dermatoscopic appearance was will now project as a looped vessel. Figure 8: Peripherally this lesion shows a pattern of coiled vesselsglomerular vessels tightly coiled vessels resembling the glomerular apparatus of the kidney Bowen disease consistent with SCC in situ. Centrally the SCC has become invasive and the dermal papillae vessels, being displaced sideways, appear as looped vessels. It can also be noticed that white structureless morphology due to highly keratinised aggregated tumour tissue, is evident centrally in association with the looped vessels. Actinic keratoses may have surface keratin and/or white circles but such lesions, not being raised and therefore not being predicted to harbour invasive malignancy, may be suitable for non-surgical treatment without biopsy. 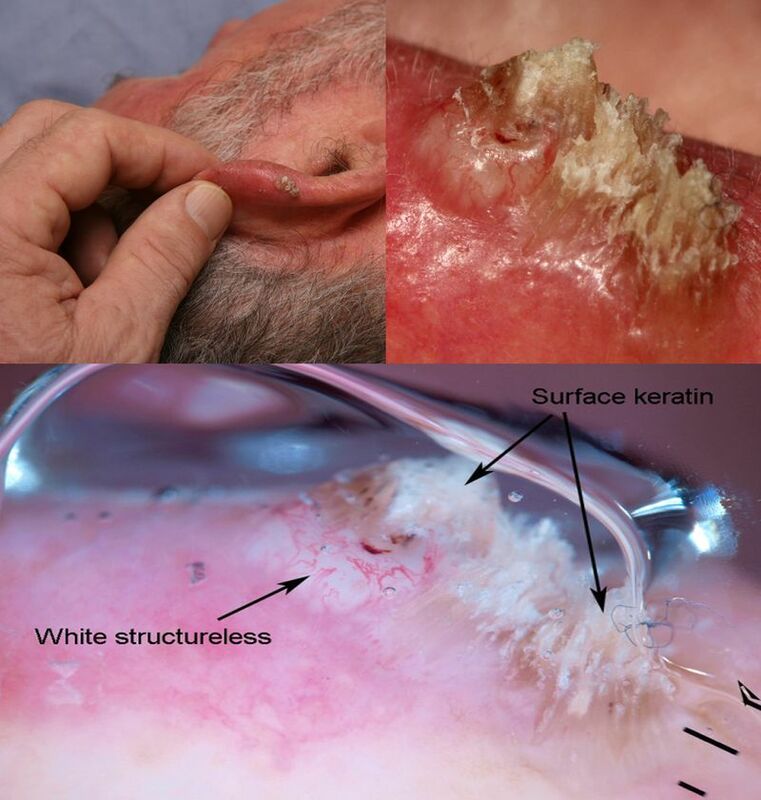 Similarly, the keratin clue of a white structureless areahomogenous pattern various diagnoses is not expected in a flat keratinising lesion, as white structureless areas in SCC/ KeratoacanthomaThis glossary term has not yet been described. (KA) correspond to significant acanthosis of highly keratinised squamous cells and if this is present the lesion will not be flat. While the presence of any of the three keratin clues in a raised non-pigmented lesion should lead to consideration of biopsy on suspicion of SCC/KA (see figures 9,10,11), the clue of white circles is regarded as the most useful clue being found to be 87% specific for SCC/KA in the consecutive testThis glossary term has not yet been described. series examined, while nearly half (44%) of SCC/KA in that series displayed dermatoscopic white circles (see figures 10,11). 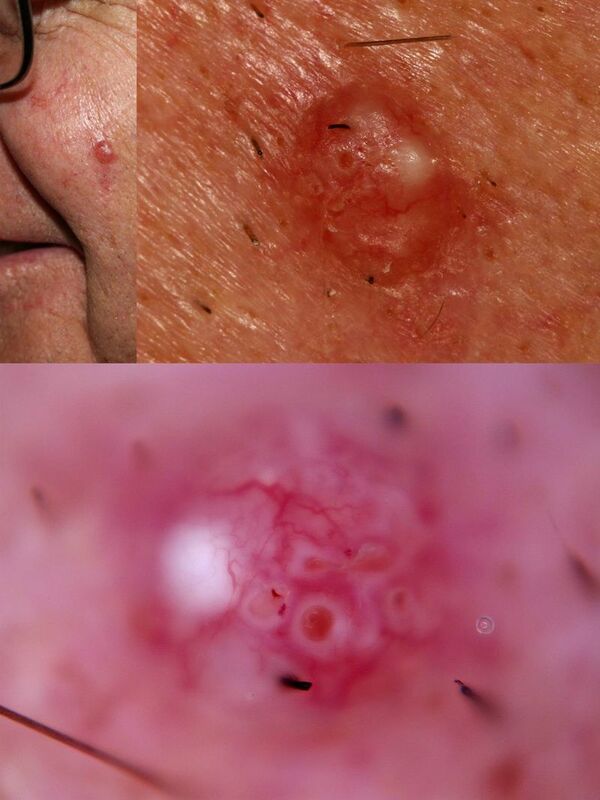 In the experience of the authors, dermatoscopic white circles have frequently enabled the confident prediction of the diagnosis of very small SCC where such a diagnosis would not have been possible for such small lesions prior to that clue being described (figure 12). Figure 9: Surface keratin and a white structureless area as clues to malignancy on a raised non-pigmented lesion; SCC. Figure 10: Dermatoscopic white circles on a raised non-pigmented lesion on the hand of a 75 year-old man. An arrow points to an obliquely orientated structure with a white cylinder surrounding a hair shaftThis glossary term has not yet been described. 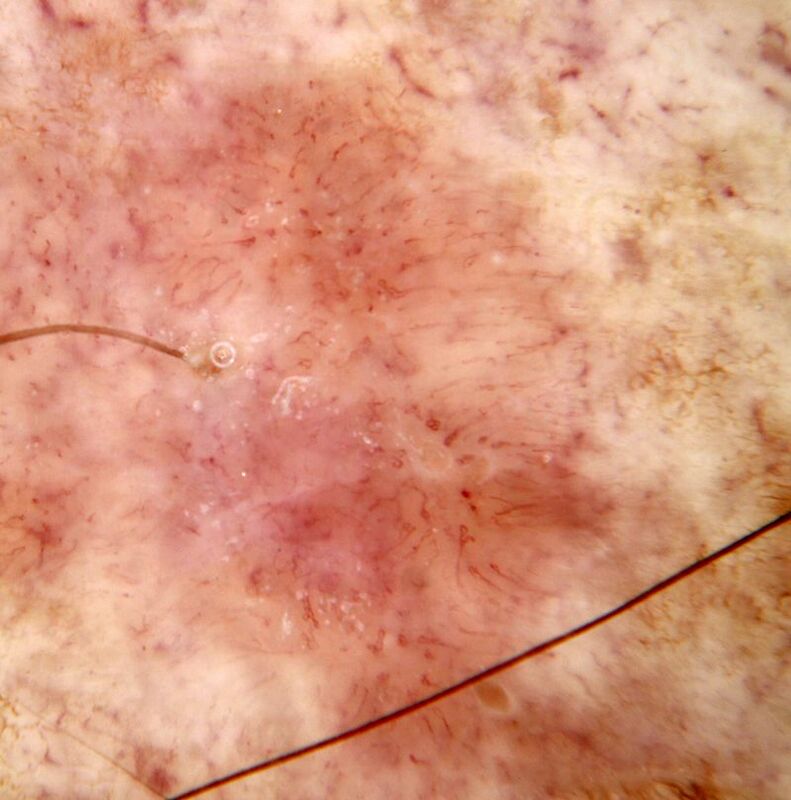 illustrating the white circle correlation of SCC invading a hair follicle. Figure 11: A dermatoscopic pattern of white circles in an SCC on the scalpThis glossary term has not yet been described. of a 48 year-old man. 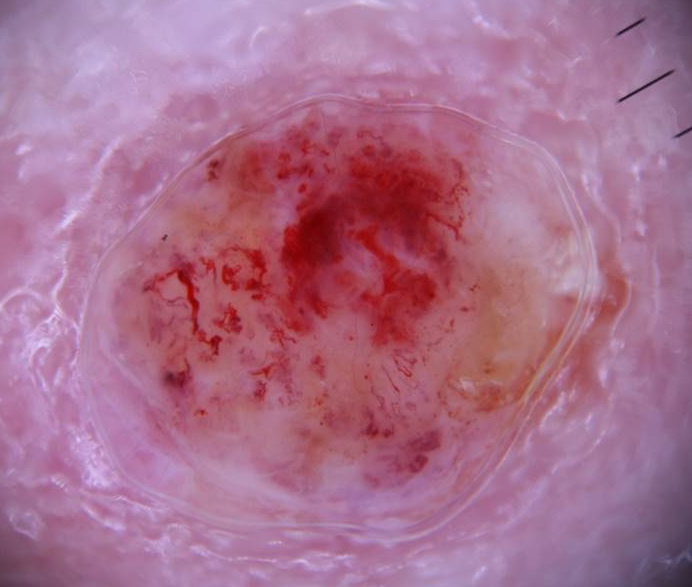 Figure 12: A very small nodule on the helix of the ear is confidently diagnosed as an SCC due to the compelling dermatoscopic clue of white circles. Step 3: Is the vessel pattern consistent with malignancy? It is only when the non-pigmented lesion of concern has neither ulceration nor white clues that analysis of vessel patterns is necessary. In fact if either of those priority clues are present then as a general rule, vessels should be considered as additional clues to a specific diagnosis rather than being relied on to avoid biopsy. 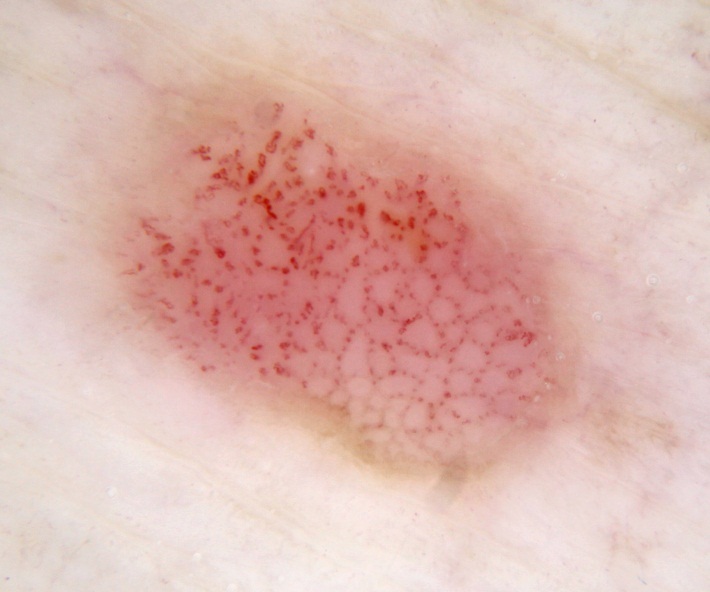 However if a non-pigmented lesion is not ulcerated and has no white lines, nor in the case of a raised lesion any keratin clues, vessel pattern analysis is the only remaining assessment possible. Revised pattern analysis precisely defines eight types of vessel structures (figure 13) and eight vessel arrangements (figure 14). The eight types of vessel structures are (Figure 13): dots, clods, linear straight, linear looped, linear curved, linear serpentine, linear helical and linear coiled. Figure 13: Vessel structures: DotsDots are small, round structures of less than 0.1 mm in diameter that have a red color when corresponding to blood vessels; however, when due to melanin, their color ranges from black, brown, to blue-gray depending on the depth and concentration of the melanin in the skin (Tyndall effect)., ClodsThis glossary term has not yet been described., Linear straight, linear looped, linear curved, linear serpentine, linear helical, linear coiled. DotSee [[Glossary:Dots|Dots]]: A vessel structure (red) too small to have a discernible shape (at 10 x magnification). Clod: A well circumscribed solid vessel structure (red or purple) larger than a dot, any shape. Linear: A vessel structure with length usually greatly exceeding width. a)	Linear straight: Linear vessels without a bend. b)	Linear looped: Linear vessels with one sharp bend (180 degrees) resulting in a reversal of direction (U-turn). c)	Linear curved: Linear vessels with one gentle bend. d)	Linear serpentine: Linear vessels with more than one bend and shaped in a snakelike fashion. e)	Linear helical: Linear vessels with multiple bends twisted along a central axis. f)	Linear coiled: Linear vessels with multiple bends and convoluted compactly. The eight types of vessel arrangementThis glossary term has not yet been described. are (Figure 14): random, clustered, serpiginous, linear, centred, radial, reticular and branched. Figure 14: Vessel arrangements: Random, clustered, serpiginous, linear, centred, radial, reticular, branched. Multiple vessels of one type may form a pattern and that pattern may be monomorphic if one vessel type predominates, or polymorphic if either more than one vessel type is present in significant numbers within a pattern or alternatively if there are separate patterns of more than one vessel type. If there is, for example, a pattern of linear serpentine vessels with a couple of dot vessels that is not a polymorphous pattern. There would need to be enough dot vessels either to clearly interfere with the pattern of serpentine vessels or as a separate cluster making a pattern of their own. a)	Random: VesselsThis glossary term has not yet been described. not arranged in any of the following specific ways (b-h). b)	Clustered: Vessels which are concentrated in certain areas of a lesion. c)	Serpiginous: Dot or coiled vessels arranged in a linear snakelike pattern (this is different to the linear serpentine vessel type). d)	Linear: Dot or coiled vessels arranged in straight lines. e)	Centred: Vessels centred in skin-coloured clods. f)	Radial: Linear vessels in a group orientated from the periphery towards the centre of a lesion but not crossing it. g)	Reticular: Linear vessels crossing at right angles to form a net-like pattern. h)	Branched: Linear serpentine vessels which divide into consecutively thinner serpentine vessels from a central main stem. There are four monomorphous vessel patterns which are consistent with a benign diagnosis when seen in a non-pigmented skin lesion. A pattern of (red, purple and/or blue) clods-only is consistent with the diagnosis of haemangioma in an apparently stable lesion (see figure 15). Normally haemangioma are diagnosed with confidence clinically and the dermatoscopist is encouraged to look at thousands of such lesions to become familiar with their distinctive but protean morphology. While it has been regarded as a rule a clods-only pattern excludes lesions with any linear vesselsLinear mildly curved vessels considered irregular when different sizes shapes and curves with a haphazard or random distribution are presented and considered regular when short and fine (thin) linear vessels prevail various diagnoses it is not at all uncommon to see haemangioma with linear vessels as well as clods (see figure 6 lower left image). This is almost universal with very small embryonic haemangiomas. Clinical correlation is required in the evaluation of such lesions. If there is some additional cause for concern, such as reported recent change, then biopsy may be indicated regardless of dermatoscopic findings and in such a situation the presence of any linear vessels would increase the index of suspicion. Certainly, any apparent haemangioma with any vessels seen within the red or purple clods should be excised. A pattern of centred vessels – only is consistent with a benign diagnosis of verruca, congenital naevus or seborrhoeic keratosis in an apparently stable lesion (see figure 16). A centred vessel pattern is defined as the presence of vessels (any type) centred in skin-coloured clods and cannot be applied if the clods are dark pink or red as such a background colour can be seen in some nodular melanomas with vessels centred in pink clods. Note that the presence of any white lines, also seen in some nodular melanomas, takes priority over vessel analysis and should lead to excision even if there is a monomorphous pattern of centred vessels. A background pink colour can be falsely rendered as skin-coloured if undue pressure is exerted on the dermatoscope foot-plate. In such a situation observation of pink colour on clinical examinationThis glossary term has not yet been described. should override observation of skin-colour on dermatoscopy and the diagnosis of a centred pattern should not be made. 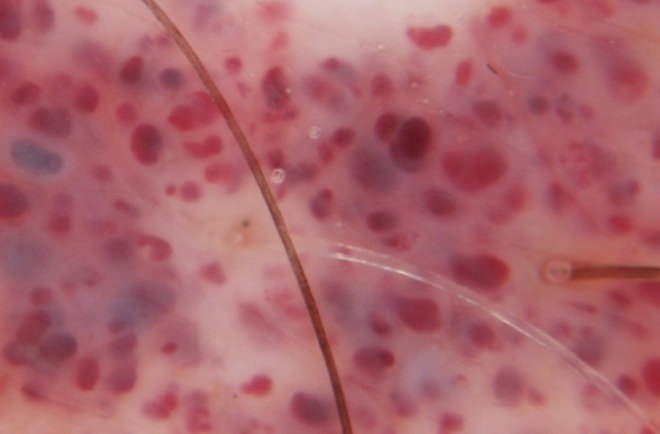 A pattern of serpiginous vesselsstring of perls Coiled or dotted vessels arranged in lines clear cell acanthoma-only is consistent with the diagnosis of clear cell acanthoma(also known as "Acanthome cellules claires of Degos and Civatte," "Degos acanthoma," and "Pale cell acanthoma") is a benign clinical and histological lesion initially described as neoplastic, which some authors now regard as a reactive dermatosis. It usually presents as a moist solitary firm, brown-red, well-circumscribed, 5 mm to 2 cm nodule or plaque on the lower extremities of middle-aged to elderly individuals The lesion has a crusted, scaly peripheral collarette and vascular puncta on the surface. It is characterized by slow growth, and may persist for years. The clinical differential diagnosis includes: dermatofibroma, inflamed seborrheic keratosis, pyogenic granuloma, basal cell carcinoma, squamous cell carcinoma, verruca vulgaris, psoriatic plaque, and melanoma. with no differential diagnosis (see figure 17). A pattern of reticular vessels- only predictably corresponds to a benign diagnosis with this pattern commonly seen in isolated patches on sun-damaged skin (see figure 18) as well as in the form of mastocytosisThis glossary term has not yet been described. known as telangiectasia macularis perstans. 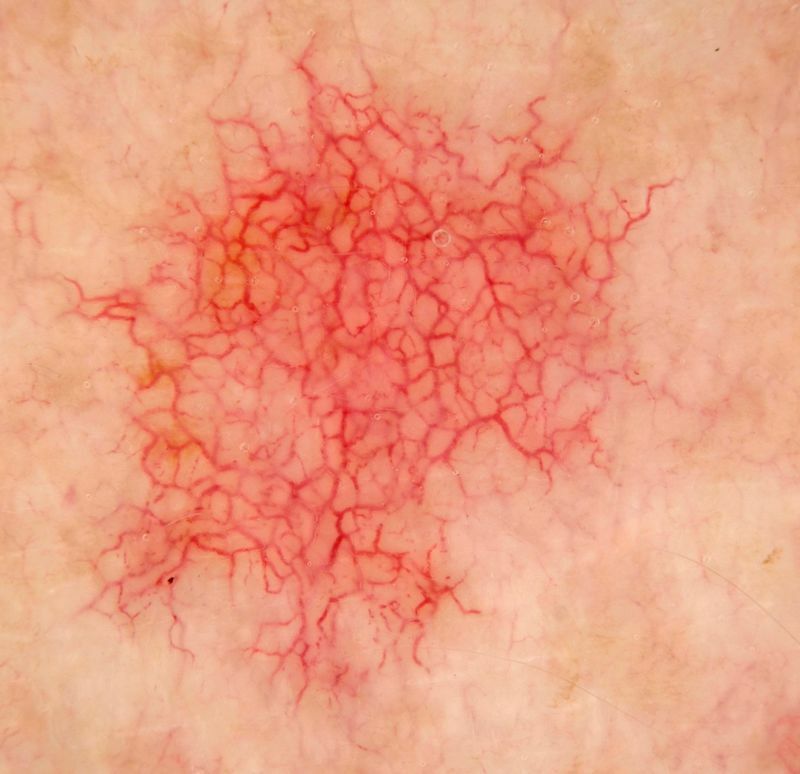 Figure 18: A reticular vessel pattern on sun-damaged skin (not excised). What is seen here are the vessels of the superficialThis glossary term has not yet been described. horizontal vascular plexus made visible by solar induced atrophy of the overlying dermis. All other vessel patterns in lesions of concern should be assessed for biopsy (see figures 19,21,22). While any polymorphous pattern of vessels can be a clue to malignancy it should be remembered that benign lesions such as seborrhoeic keratoses and most dermal naevi can also have polymorphous (linear) vessels. 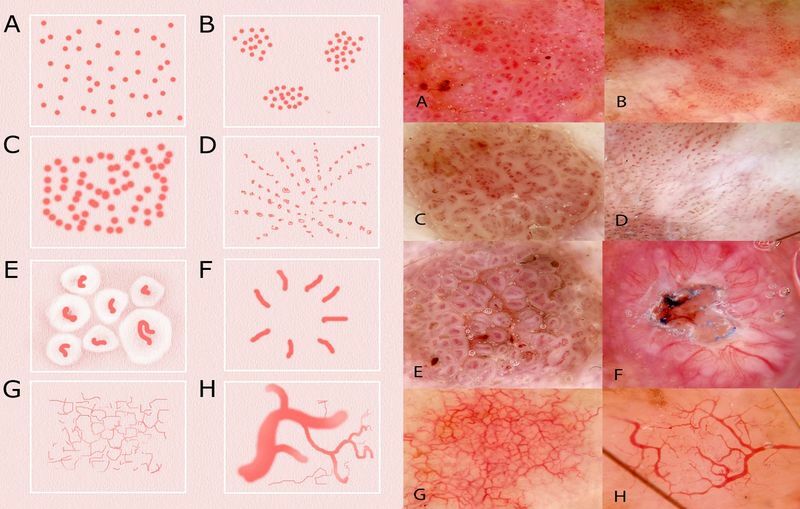 The dermatoscopist is encouraged to look at thousands of obviously benign examples of these lesions to become familiar with their distinctive but protean vessel morphology. 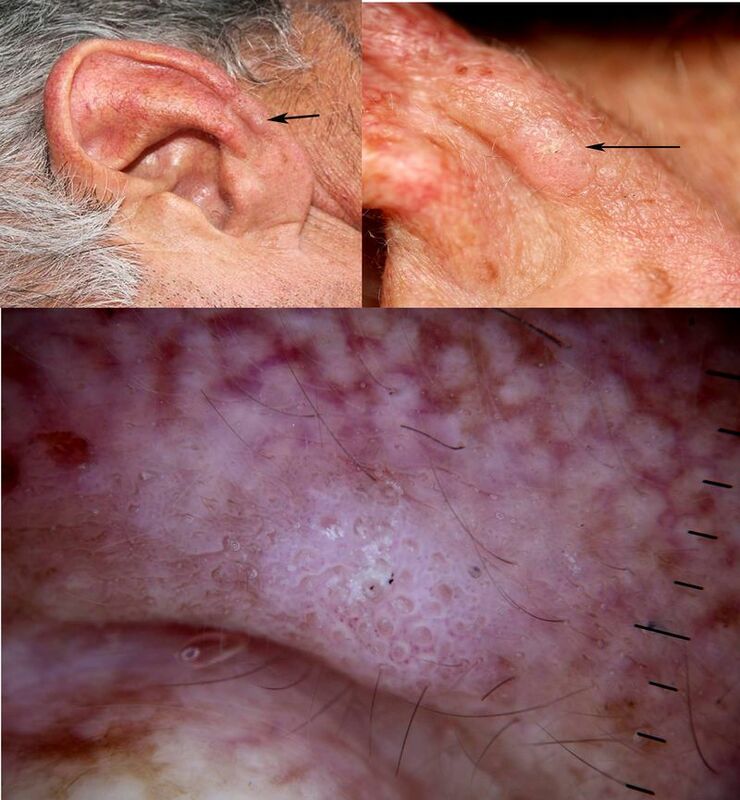 Figure 19: This non-pigmented lesion on the cheek of a 62 year-old man shows no evidence of ulceration or white clues (white clods/dots are not regarded as white clues in Prediction without Pigment because they are commonly encountered in benign lesions and additionally this lesion is not raised). None of the 4 benign vessel patterns are present and in the context of a discrete lesion a pattern of branched serpentine vessels, thrown into sharp relief by translucent stroma is most consistent with a diagnosis of BCC. Note that the serpentine branched vessels are not unique to the lesion, blending seamlessly with the perilesional superficial dermal vascular plexus. What is unique to the lesion is the translucent stroma which casts the vessels in sharp relief. Figue20: A nodular lesion on the cheek of a 68 year-old man has serpentine branched vessels which might be considered consistent with a diagnosis of BCC. Applying Prediction without Pigment, there is neither ulceration nor white lines but there are white circles and a white structureless area. These clues have priority over vessel clues leading to the correct diagnosis of SCC. Any polymorphous vessel pattern which includes a pattern of dots in addition to any pattern of linear vessels raises suspicion for melanoma (see figures 21 and 22). This assumes again that the lesion is not an unequivocal seborrhoeic keratosis or dermal naevus because scattered linear and dot vessels are not uncommon in such lesions. It is assumed that vessel analysis is being applied to a discrete lesion that does not have compelling criteriameasure of how well one variable or set of variables predicts an outcome of any common benign entity. Also a few dot vessels in a lesion with predominantly linear vessels does not constitute a pattern of dot vessels. 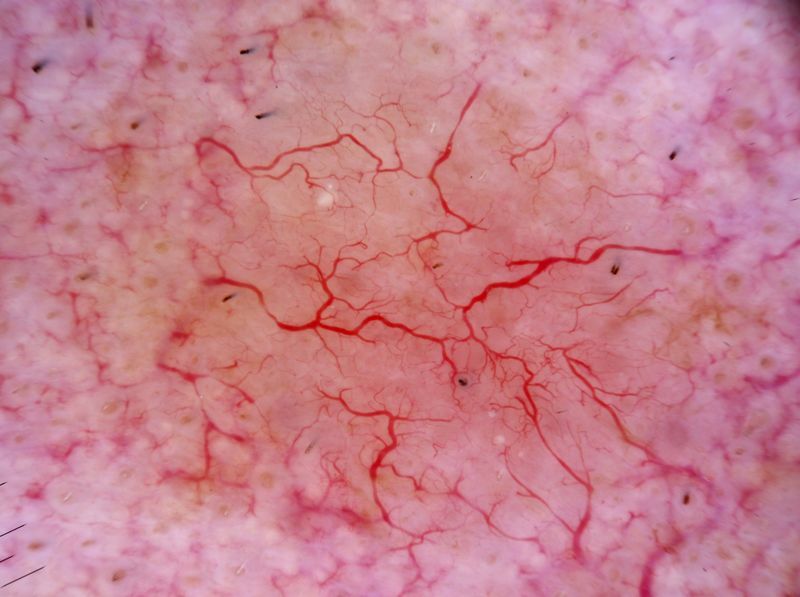 The pattern of dot vessels in a melanoma will usually, but not always appear as a separate pattern of vessels rather than speckled in between linear vessels. Dot vessels are only expected in the macular part of a melanoma because they actually represent prominent dermal papillae vessels projecting vertically from the superficial vascular plexus towards the epidermis and once a melanoma becomes invasive the normal organised morphology of the dermal papillae becomes distorted with lateral displacement meaning that dermal papillae vessels will project as linear vessels of various types. Linear vessels, either laterally displaced dermal papillae vessels, dilated dermal plexus vessels (usually serpentine) or polymorphic linear vessels (looped, curved, serpentine, helical or coiled) can be seen in both macular and raised portions of a melanoma. A melanoma may also have a polymorphous pattern of linear vessels without a pattern of dots in which case the different vessel types are likely to be combined in a random arrangementThis glossary term has not yet been described.. Figure 21: Dermatoscopic image of a hypopigmented melanoma with a polymorphous vascular pattern including a vast pattern of dot vessels. Figure 22: A non-pigmented lesion treated by curettage and cautery on suspicion of BCC. Fortunately because the diagnosis of BCC was not made with absolute certainty a shave biopsy 1mm thick was performed first and histological diagnosis of invasive melanoma Breslow 0.3mm was made. In retrospect, as well as a pattern of linear serpentine vessels, there is a cluster of dot vessels at the upper extremity of the image. As with Chaos and Clues, Prediction without Pigment should not be regarded as an ultimate method, set in stone. It has also been designed as a useful tool, and it is suitable for seamless integration into routine practice. We encourage our colleagues to use it as a framework on which to organise their accumulated experience and to adapt and individualise the method for their own style and practice. ↑ 1.01.11.21.31.41.51.61.7 Rosendahl et al. : Prediction without Pigment: a decision algorithm for non-pigmented skin malignancy. Dermatol Pract Concept 2014;4:59-66. PMID: 24520516. DOI. ↑ Rosendahl et al. : DermatoscopyThe examination of [skin lesions] with a 'dermatoscope'. This traditionally consists of a magnifier (typically x10), a non-polarised light source, a transparent plate and a liquid medium between the instrument and the skin, and allows inspection of skin lesions unobstructed by skin surface reflections. Modern dermatoscopes dispense with the use of liquid medium and instead use polarised light to cancel out skin surface reflections. in routine practice - 'chaos and cluesThis glossary term has not yet been described.This an algorithm used in dermoscopy [[Chaos and Clues]]'. Aust Fam Physician 2012;41:482-7. PMID: 22762066. ↑ 7.07.1 Rosendahl et al. 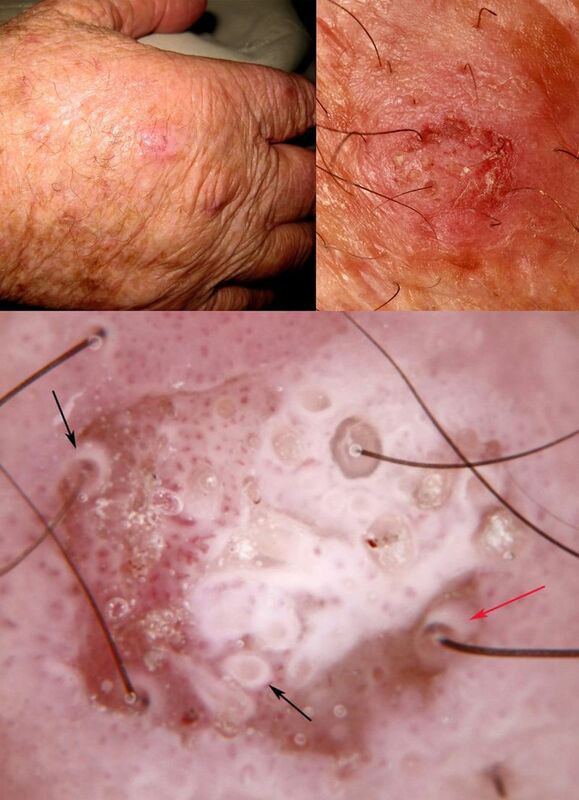 : DermoscopyThe examination of [skin lesions] with a 'dermatoscope'. This traditionally consists of a magnifier (typically x10), a non-polarised light source, a transparent plate and a liquid medium between the instrument and the skin, and allows inspection of skin lesions unobstructed by skin surface reflections. Modern dermatoscopes dispense with the use of liquid medium and instead use polarised light to cancel out skin surface reflections. of squamous cell carcinoma and keratoacanthomaThis glossary term has not yet been described.. Arch Dermatol 2012;148:1386-92. PMID: 22986634. DOI. This page was last modified on 4 October 2017, at 12:26.